Surprise! 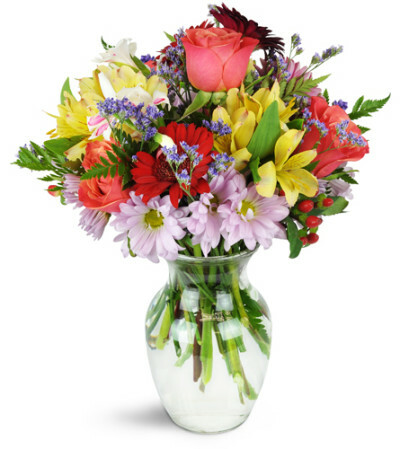 A rainbow of blooms is a cheerful celebration of any occasion. Multicolored and festive, it's perfectly fun gift for a special day. 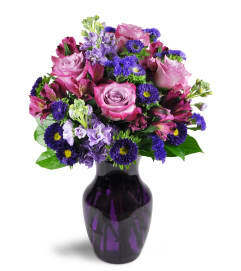 A variety of multicolored roses, gerbera daisies, alstroemeria, and more are arranged in a classic glass rose vase. Flowers were delivered same day and looked exactly like the online picture.Thank you for making it easy for me to send flowers for my family all the way in Germany!Also really loved the pre-selected notes that are made available in case you need some inspiration on what to write! Reed & Cross is a Lovingly Florist in Eugene. Buying local matters. Discover how Lovingly supports local florists. Copyrighted images herein are used with permission by Reed & Cross.